Have you ever tried drawing manga on your ipad? This week, when ever I got creative, it was digitally. No, not photos. Drawing. I don’t know what it was, maybe it is hormones, but I had another bad (mood) week, plus David was on a biz trip, so I felt like gifting myself something. Getting myself a little something. You know, new shoes, a purse, girly things. Stooooop! Back that up a sentence or so. Right up to ‘… you know,…’ well, if you know me than you know that I don’t fall for shoes or bags, like ever. However, I do fall for tech toys, badly. So, what did I get myself? A new iPad. An iPad Pro actually, because I had read good things about its drawing capabilities together with the Apple pencil. And once I got that toy it needed to be inaugurated, tested and trialed. 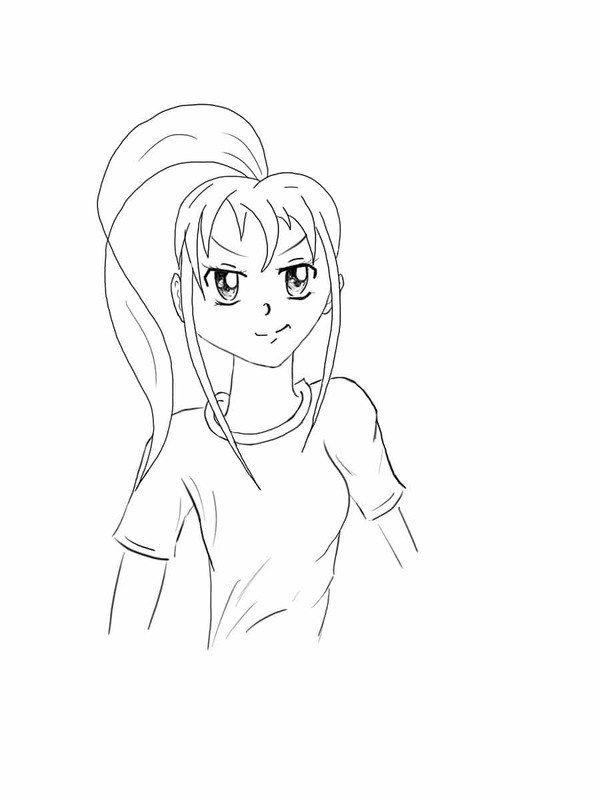 So the past couple of evenings I sat in front of my computer looking at images and at YouTube videos and was drawing… manga. Or manga-esc like. Just because. I had the whole screen full of different manga pictures and let myself be inspired by the work of all the different artists. And the iPad Pro did not disappoint. I mean, it is still ‘drawing on glass’, but it feels a whole lot better than on my old iPad. On which I gave up drawing rather quickly. Drawing in Sketchbook on the iPad Pro I will definitely be exploring further. But who knows, maybe I’ll go back to good ol’ paper tomorrow. You just never know with me. How about you. Are you sticking to one medium or are you more of a butterfly like me, trying this and that? Anyways, here are a couple of drawings I did that I am pretty happy with. So much so that today I imported them to my desktop and opened them in Photoshop and started coloring one of them. Coloring really is a lot of fun. I haven’t started with any color on the second one yet, but I surely will soon. Don’t you think it would like some color-love? But for now, that’s it from me. I hope to be seeing you all on Monday for our #OneGoodThing linkup. Until then – enjoy my drawings and your weekend! …also manga is nu gar nicht meins. ausnahmsweise toleriere ich in deinem falle wie geschrieben dein bisschen advertisement. würde mich freuen, herzlich Pippa – vielleicht hast du ja interesse dich anzuschliessen, ab und zu, immer?! es geht bunt zu! P.
That’s pretty cool! Flying to New Orleans last fall, I watched a girl next to me drawing tiki style masks that she was going to have printed out on some kind of card stock and cut out. They were to wear to a party she and some friends were attending. It was very soothing to watch her draw and color. I am intrigued. It seemed easy. Is it really? Claudia, you never cease to amaze me. I must say, I cannot do what you do, though I admire your work and you. However, your art often inspires me to write. I think that counts. Hugs. Oh I love the manga!! That is awesome. It looks great with colour, but I kinda want one without on a t-shirt. I think it would look so cool. Love this! Looks like you had fun! I do like your drawings and I could see the color added to the 2nd one. It is good to treat yourself from time to time and it sounds like you are enjoying it! Have a great weekend! They’re lovely! Manga is such a beautiful style. Fantastic manga illustrations ~ very dynamic! interesting with the iPad Pro. I´ve been thinking of buying something to be able to draw on my images. But yours don´t seem to do that as you write you have to import them to PS. But it looks great. Have to check it out. Oh, no, no, no, you can absolutely draw on photos or on a blank canvas or write on a photo or do a composite. You can do anything your chosen app allows you to do. I could have colored the sketch right there in Sketchbook or I could have done it in any other app on the iPad. I just chose to upload it and then do the rest on my desktop. I really like drawing on the iPad Pro – did some more just now when I saw your comment and thought to immediately reply, since I gave you a wrong impression 🙂 Let me know if you have any questions. You may also email me ([email protected]) if you like. sei mir nicht böse claudia, aber mit der werbung auf deiner seite, das ist mir jetzt doch zuviel! gehab dich wohl, war eine zeitlang sehr schön bei dir. eine neue zeit beginnt! P.
HI Claudia, you really know how to treat yourself! I can’t draw to save my life, I do love doodling though. Your drawings are fantastic, perfectly basic (if you know what mean). I love the before and after one.